It’s unlikely they’ll become particularly huge this year but with average age of about 13, Pull In Emergency have much to look forward to. A single is due out on Mute Records soon and they’ve appeared on BBC’s Culture Show and in The Guardian recently. Jangly pop akin to The Smiths with Libertines-esque energy and remarkably mature vocals, Pull In Emergency write songs about getting lost on the London Underground and dumping your partner. Awesome! A single due out on This Is Fake DIY in March and gigs all over the place in the near future – it can’t be too long before a major label snaps them up and peddles them as the new Futureheads or something. But no matter for this is quirky, addictive pop along the lines of fellow scousers and generally amazing bands Hot Club de Paris and The Wombats. 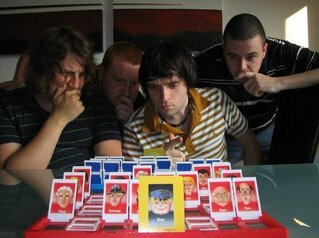 Plus they have silly song titles, witty lyrics and a genius Guess Who? theme going on! Recently signed to taste makers Transgressive Records (Battle, Ladyfuzz etc), they generate an amazing racket somewhere in between The Rapture and ¡Forward, Russia! The aural experience becomes all the more pleasurable when witnessing their pulsating live performance. A mean touring schedule this Spring takes them to SXSW as well as supporting labelmates The Young Knives. A warning for those who will be seeing Foals soon – they have an insane following, beware the moshpits. Or embrace them. This Foals track is a bit of an oldie, check out the newer stuff on their MySpace. Like the fact that drummer George Barnett was named no.47 in the NME Cool List 2006 and their supposed use of Nazi symbolism (see Playlouder interview), I’m not entirely sure what to say about this lot. It’s post-punk but it’s so much more than post-punk at the same time – it’s pulsating, it’s space-age, it’s…just listen for yourselves. With a sold out EP already under their belts and considering fellow Southenders The Horrors managed it (somehow), it could be very possible that they enter the mainstream consciousness this year despite their obvious rawness. So that's my top twelve for 2007, we'll have to wait a while to see whether any of them can truly make it big this year but hopefully it'll be worth the wait.